Normal nightly rate is $175.00 per night. 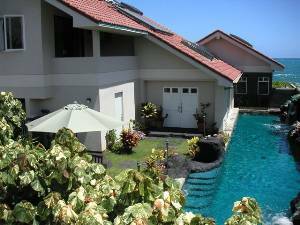 Kailua oceanfront deluxe vacation rentals - two units located in oceanfront home in Kailua on the ocean. One unit faces the mountains and the outer faces the ocean. Both have separate entrances, bathrooms, and kitchenette facilities. These are deluxe rooms with 16-foot vaulted ceilings, air conditioning, granite detailing in the kitchen and bathrooms areas,tiled floors with area carpets. Private and trangquil, accommodations are limited to 2 adults only in each rental unit. The Mountain View Unit is a studio that faces the pool and the emerald hued Hawaii Mountains. The kitchen area has a separate kitchen sink, kitchen island, and full size refrigerator. 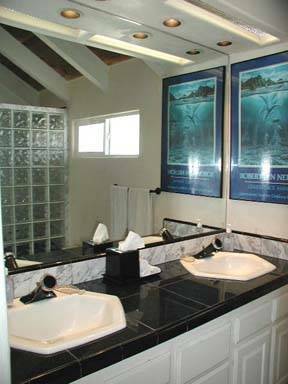 The bathroom features two sinks with a granite counter top and a marble and granite tub shower. There is a walk-in closet. The unit is cooled by air conditioning and an overhead ceiling fan.There are two lanais, one faces the pool and mountains. The other lanai views the ocean from the side of the house. The Ocean View Unit has one bedroom plus a sitting room. This unit faces the Pacific Ocean through large windows. The kitchenette in this unit has an undercounter refrigerator/freezer. The bathroom features a large sink and granite counter top. There is a tiled shower tub combination. There is a large closet. The unit is cooled by air conditioning and an overhead ceiling fan. The outside lanai faces the ocean. -Enjoy the 60-foot, natural salt (no red eyes or green hair), lap pool with waterfalls. Contact us for more photos and details - Tom Coffey. AWARD WINNING BED AND BREAKFAST. Recipient of the Most Romantic Hideaway Award, two years in a row. Highlighted in Travel Magazine. One of the best-kept secrets in Hawaii is this beautiful B&B.